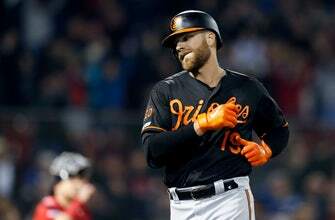 BOSTON (AP) — Chris Davis extended his record hitless streak to 0 for 54 when he lined out to end Baltimore’s 6-4 loss to the Boston Red Sox on Friday night. Davis pinch-hit with two outs and none on, and hit a soft liner to second. The former home run champion is 0 for 33 this season. Davis’ drought is the longest ever by a position player.